As musicians we learn about today's major and minor keys that are fundamental to the structure of modern western music. These two keys and the tuning system for the notes they use were settled on during the 17th century, but there was a long history behind them. Knowing more about this history helps us better understand medieval and renaissance music, and some of the curious sounds that come of it. Legend has it that Pythagoras, whilst out walking one day, heard the sounds of blacksmiths at work and noted the harmonious sounds of the hammers ringing out. So in the interests of science he returned later at night and pinched the hammers. He took them home and weighed them and found them to be 12, 9, 8 and 6 cubits respectively. He noted that when the 12 and 6 cubit hammers were struck, the sound blended nicely, and the same for the 12 and 9 and the 12 and 8 hammers. But the sounds of the 9 and 8 hammers together clashed. Liking numbers, and especially fractions, Pythagoras spent a noisy evening working out these ratios, and saw that by applying the 12:8 ratio and then doubling the size of the result and repeating this process (now known as a "cycle of 5ths"), you could get a set of tones that could be used to make pretty good music, and at the same time drive all the neighbours crazy. He noted that the simpler the ratio between two tones, the more consonant they sounded. Table 1: Cents are a modern measurement; there are 1200 cents per octave. Upper notes are based on a lower note of C.
Using these ratios as justification, Pythagoras proved that the unison, the octave, the 5th and the 4th were pretty good and the tritone was ghastly. A short cycle of 5ths (eg: F-C-D-G-A) can be used to produce the pentatonic scale (C-D-F-G-A), and this is the basis of folk music in many cultures. Continuing the series will derive the 12 tone octave that our modern music is based on. The only real problem with using these ratios is that as you continue the cycle of 5ths, the tones derived slowly move further away from being in tune with the original starting note, and the interval between any two tones near either end of the cycle sounds really bad. Thus the scale developed by the Greeks was good, but had its limits. For one thing, you would need to re-cast your hammers if you wished to transpose to a different key. 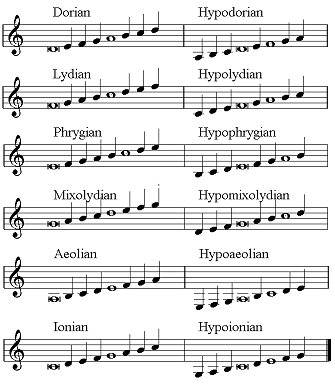 The Greeks went on to describe a set of scales; Dorian (starting on E), Phrygian (D), Lydian (C) and Mixolydian (B), that could be used as the basis for music. They also transposed all of these scales into the octave E to e, just to create headaches for instrument makers. The vocal range of the chants tended to be up to an 8ve. The finale note was usually D, E, F or G.
The melodies tended to rise to a tenor (or dominant) pitch above the finale note. Notes were either all above the finale (authentic) or a mixture of above and below (plagal). Eight modes were specified to classify this behaviour. These were called 1, 2, 3, 4, 5, 6, 7 & 8. See the main table for details. By about the year 1000 composers began to agree with Pythagoras that the tritone sucked, so a few of the modes were modified so that B was never used as a dominant. Taking further heed of the wisdom of the ancient Greeks, they renamed the nodes with their Greek names, but of course got them mixed up. Fig 1: Example Dorian chant, showing tenor A and finale D (Jeppesen, p64). Chants got longer and more complicated as the art form developed, and the modes even had an impact on pop music of the time. This applies more to the trouveres, who were educated, than the troubadours, who weren't. Polyphony started out in Europe with people humming along a 5th above the chant, and soon developed into a bona-fide compositional technique, featuring unisons, 4ths, 5ths and 8ves, and maybe 2nds and 3rds for a bit of dissonance. The finale note gained in importance, featuring more prominently throughout the piece, re-enforcing the mode's foundation to make it satisfying to the listener's ear. The problem is that, with all the 5ths and 4ths being sung at the same time, you'll get tritones happening when ever B and F are sung together. People worked out that if they calculated B by going down by a 5th from F, they wouldn't have a tritone. So composers started marking B's as "b" for this new flatter B and "#" for the old B. Since this new B was used so much, in or about the 12thC they invented the key signature, such that the B-flat could be default throughout the piece of music. Of course then you start getting a tritone between B-flat and E, but you can't win them all. By the 16thC flats and sharps were being used willy-nilly throughout music, as were 3rds and 6ths, and suspended dissonances (the bare perfect 4th was now relegated to a dissonance). The subtonic, when used as a leading tone to get to the tonic, was set to be a half step. In some modes this meant the leading tone was sharpened with an accidental. This gave a major 3rd to the dominant chord. People also decided that it sounded much cooler to end on a major chord, so the third of the final chord was allowed to be sharpened (if necessary) to do this. This gave three commonly altered notes; B which was raised or lowered no matter what the mode, the leading tone, and the 3rd in the final chord. Composers had also worked out that if the pitch of the piece was in a bad range, you could transpose up a 4th and add a B-flat key signature to make it easier to sing. To some extent you could also up it again and add an E-flat (also marked by a "b", to save confusion) to the key signature. The change to polyphony had made it very difficult in to tell the difference between plagal and authentic modes, so the plagal ones were, in general, given the flick. And, noticing that you could continue the series, modes on A (Aeolian) and C (Ionian) were added, though still no-one wanted to have a mode based on B, because of the tritone between the tonic and dominant. Fig 1: The basic scales for each mode. The "finale" and "tenor" are marked. Lastly, composers realised that if you transposed Ionian up a 4th it sounded just the same as Lydian, except better because you avoided the B natural, so they also gave Lydian the flick too. Still the big problem was that the modes could not be transposed to any old starting note due to instruments being based on Pythagorean tuning, and thus the series of tones and semitones in the scale would sound different from different starting notes. Various theorists in the 16th and 17thC put forward alternate turning systems (with as many as 32 notes to an octave) in hopes of solving the problem, but such came to nothing, partly due to the need to completely change the written language of music, and also the extra number of fingers musicians would need to grow. In the 17thC a new system of "well tempered" tuning was defined such that every tone was adjusted slightly, but not so much as to make consonant intervals dissonant. This dealt with the gap created by following the cycle of 5ths, and meant that although all the old instruments had to be re-tuned or thrown away, written music was still useful and composers could finally start putting sharps in the key signature. Note: In the following table the sequence of pitches is [GG A B C D E F G a b c d e f g aa bb cc dd] in order from lowest to highest. Ancient Greek 1 Dorian E-e E To E-e Pythagorean tuning based on 12:9:8:6 ratios. 12:6 = 8ve, 12:9 = 5th, 12:8 = 4th, 9:8 = Maj 2nd. 7th C 1 Authentic Protus D-d D a C Authentic = Melody is mainly above tonic. Plagal = Melody is above and below tonic. Authentic dominant was a 5th above tonic. Plagal dominant was a 3rd above tonic. 11th C 1 Dorian D-d D a C They got the Greek names mixed up. 3 Phrygian E-e E c D Dominant changed to avoid tritone. 4 Hypophrygian B-b E a D Dominant changed in line with phrygian. 8 Hypomixolydian D-d G c F Dominant changed to avoid tritone. 16th C 1 Dorian D-d D a C# Up a 4th to G Plagal and authentic merged due to polyphony. If there's a B-flat key sig, it is transposed. Didn't want a mode starting on b because of tritone. Lydian dropped in favour of Ionian. 17th C 9 Minor a-aa a e G# To any key Well tempered tuning allows full transposability. Some of these are from The Lochac Song Book, published by Dafydd of the Glens. You can also try the Choral Public Domain Library. Petit Vriens, a 15thC Itallian dance. Hindemith, Paul, The Craft of Musical Composition, Book 1, Schott, Mainz, 1970. Jeppesen, Knud, Counterpoint, The Polyphonic Vocal Style of the Sixteenth Century, Dover Publications, New York, 1992. Morley, Thomas, A Plaine and Easie Introduction to Practicall Music, Peter Short, London, 1597. Seay, Albert, Music In The Medieval World, Prentice-Hall, Englewood Cliffs, New Jersey, 1975. Agricola, Martin (Tr. John Trowell) The Rudiments of Music (Rudimenta Musices), B. Rainbow (Ed), Boethius Press, Aberystwyth, Wales, 1991 (1539). Copyright Jaysen Ollerenshaw, 2001. Free use for non-profit. This article first appeared in issue 18 of Cockatrice.